Black and white negative showing the Whitby Venturers Expo 67 Canoe Trippers float for the County Town Carnival parade. 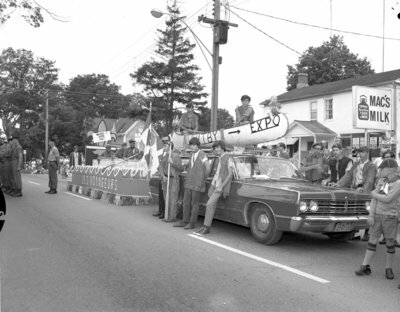 The float is pictured in front of the municipal building at 405 Dundas St. W.
Benny LaHaye took a group of Whitby Venturers on a canoe trip to Expo 67 in Montreal to celebrate Canada's Centennial. Expo 67 Parade Float, 1967. Bill Stannett. Whitby Archives, 30-016-002.